CW3E researchers Brian Kawzenuk and Scott Sellars and DRI researcher Nina Oakley provide a preliminary analysis and synopsis of a weak Atmospheric River that made landfall over southern California on 5 January 2016. The AR was the first event in what will be an active week over the North Pacific and brought significant precipitation throughout central and southern California. The AR initially developed near Japan and propagated across the entire North Pacific Ocean before making landfall. A brief forecast for the rest of the week is also provided by the San Diego National Weather Service Forecast Office, courtesy Roger Pierce. Above is a sequence of SSMI water vapor imagery from 01-05 January 2016 which shows the Atmospheric River propagating towards California and making landfall. Above is a sequence of integrated vapor transport (IVT) from the GFS analysis during 31 December 2015 to 5 January 2016 which shows the Atmospheric River propagating towards California and making landfall. Above is a sequence of Jason Cordeira’s AR Landfall tool initialized between 0600 UTC 29 Dec 2015 and 0600 UTC 5 Jan 2016. The sequence shows how the forecast developed over the previous eight days and shows the skill this tool had in forecasting the AR. For more information on this product visit the AR Forecast page. 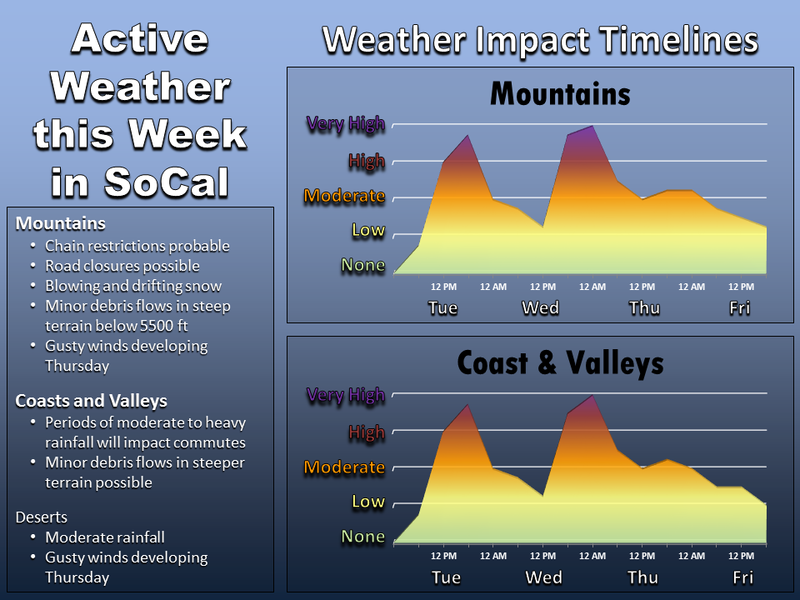 The weather pattern in SoCal will be very active this week with several storm systems moving through the region. This afternoon through Wednesday morning will bring moderate to heavy rainfall over the coast, valleys, foothills and deserts, with heavy snowfall occurring in the mountains above 5,500 ft. Total snowfall for the through Wednesday morning will be around a foot for elevations above 5,500 ft, with lesser amounts between 4,500 and 5,500 ft. Rainfall totals through Wednesday morning will be 1 to 1.5 inches west of the mountains with local amounts near 2 inches in the foothills. If you have travel plans at anytime during the week, especially in the mountains, check local conditions and be prepared for inclement weather. Another storm with moderate to high impacts will affect the region Wednesday afternoon through Wednesday night. A third system on Thursday will bring additional rain and mountains snow, but it appears to be less intense than the first two.